I might only get there in my mind (or in the next Star Wars MMORPG), but I’ll get there. 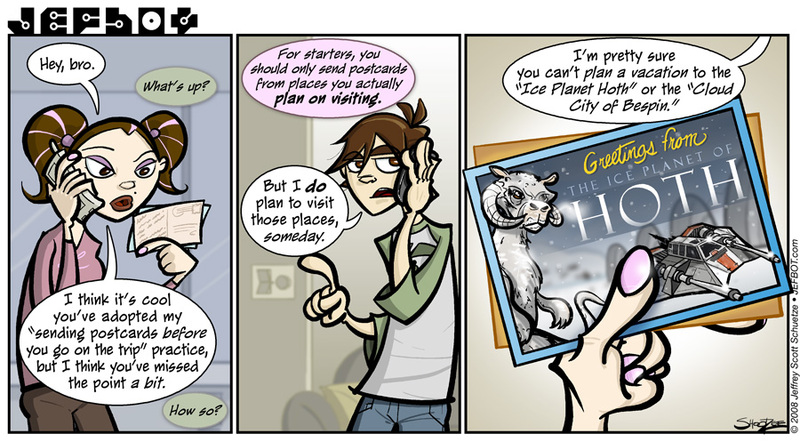 And if you don’t know what Lor’s talking about in that first panel (“sending postcards before you go on the trip”) check out the previous strip, JEFbot.73_Wish You Were There. brobot you’ve totally captured our little sister! hey, how come i didn’t get a postcard? I always wanted to visit Bespin. Youre a real deep thinker. Thanks for shianrg. Ha ha. If Lucas knew what was cool, he’d totally steal your idea and start selling these postcards. If he were really cool, he’d get you to design these postcards for sale. and as angry as i am at lucas, especially after the prequels and the clone wars cgi “movie”, i’d do it in a heartbeat. Coincidentally, I can identify w/the whole postcard dilemma of getting home before the postcard and that’s why I didn’t send any on my vacation. 🙂 I almost like the idea of getting cards from places that don’t exist… almost. Just caught up on all the strips I’d missed while I was away. I think they’re getting even better… and you know I already thought they were super! thanks, mombot! glad you’re all caught up. your postcard’s in the mail. Geez thanks. 😉 Now you almost….almost made me want to go and download SWG again. But fortunately I have enough self control not to go play the game that Sony ruined again. I totally know what you mean though. Flying around on Hoth and Bespin were such great things. It was so nice to just go and sit on a Dewback on Tattoine. Ah the glory days of SWG. Anyways GREAT comic you have here. I saw it advertised (I believe) at http://www.reallifecomics.com. Your sense of humor is as twisted as mine. Keep up the great art and whit. thanks for giving JEFbot a try, jereme! have you played through “the force unleashed” demo? while i don’t think it has any visits to hoth or bespin, i think i’m going to have to pick it up anyway. Jefbot, look at you takin the joke to a whole new level….or should I say, “world.” Great work once again. I love your Hoth postcard! Awesome! My parents went to the Ice Planet Hoth and all I got was this lousy teeshirt. yeah, milas, but did you get a postcard? Ever been to Chicago in January or February…? Try it out, you’ll feel like you visited Hoth. Great strip. Amazing art style and humour. eleventeen, your kind words are much appreciated. btw, do they have snowspeeders in chicago? if so, i’ll definitely plan a visit. That last planet is gorgeous! And apparently Lor has never been to Disneyland because they’ve been promising that Hoth trip for YEARS now! Oh sure, you can visit Hoth, I hear it’s nice this time a year! Very funny as always! I do believe I am going to start pre-sending postcards too! I saw this and pondered by the time we get to Hoth or Bespin would they be tourist traps? I see a wax museum on Bespin depicting the last supper before Han gets put into the freezing chamber. And Hoth becoming an all-inclusive ski resort. Lucus is going to continue to steal my childhood isn’t he? yes. yes he is, StrangeRebel.